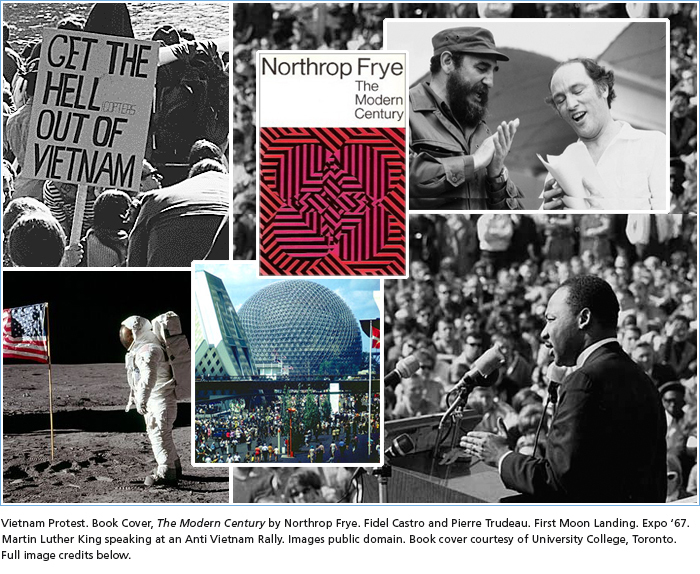 Frye’s optimism in his concluding chapter is, ironically, in light of the current state of the world, a good illustration of his view that the idea of progress is a donkey’s carrot, and that the only thing that can direct the course of change is the human will to change society as it is into the kind of world we wish it could be. No autonomous forces will do it for us. That will depends on a social vision and is ever vulnerable, as Frye argues so lucidly in the opening chapter, to the oligarchic and economic structures of modern society and its rhetorical organs, advertising and propaganda. It is for that very reason that his analysis of how the structure of society might be transformed in a progressive direction is all the more powerful today. In the current climate of austerity and utilitarian cries for “relevance,” his discussion of the role of the humanities in the university and of the central importance of art and literature in society, seems even more resonant now than it was close to fifty years ago. Images: Vietnam War Protest in Washington, D.C. by Frank Wolfe, October 21, 1967. A protest sign reads GET THE HELLicopters OUT OF VIETNAM. / Book Cover: The Modern Century by Northrop Frye. Oxford University Press, 1967. / Cuban Prime Minister Fidel Castro and Prime Minister Pierre Trudeau join in a singalong during Trudeau's Latin American Tour, January 1976. National Archives of Canada Credit: Duncan Cameron/National Archives of Canada, PA-136976. / Apollo 11 astronaut Edwin Aldrin poses for a photo beside the U.S. flag on the Moon (mission time: 110:10:33). Date, 20 July 1969. / Canada Expo 1967, Library and Archives Canada, ACCESSION # 1970-019. / Martin Luther King, Jr., speaking against the Vietnam War, St. Paul Campus, University of Minnesota, 27 April 1967. Minnesota Historical Society.